The all new RTMS software combines the easy to use Smart Touch View Interface (STVI) software, with Advanced Visual Test Software (AVTS) preconfigured Relay Test Module Templates representing several major relay manufacturers. 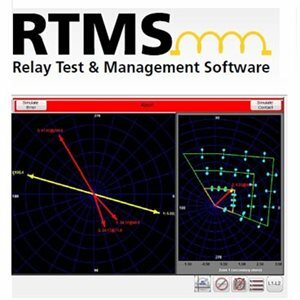 The RTMS is the new software platform for all relay testing requirements using the Megger SMRT Family of relay test systems. This software runs on the Smart Touch View Interface hand-held controller, as well as the built-in Smart Touch View Interface in the SMRT D series (410D, 46D, 43D, 36D units), and also runs on your PC. Together, the RTMS and PowerDB is your complete relay testing solution. From testing simple to complex protection relays and protection schemes, to relay asset management and compliance reporting, RTMS has it all.